Will You Take The $5 Million? Will You Take $5 Million? If I were to give you $5,000,000.00 would you take it? Well, of course there is a catch. It would be a trade off between the payout and Television…FOREVER! Would you really give up television FOREVER? For some folks this is an easy YES! But for the majority, there is some hesitation involved before they shout their answer. Sounds crazy doesn’t it? I mean, ANYONE can use an extra $5 Million, but is the sacrifice worth it? Really think about ALL the television that is being watched on a daily basis. Think about all the sports, news, reality TV shows, etc. (this does include internet TV) The $5 Million is appealing, but who can truly say they will uphold their end of the deal? The majority of folks would be in denial or have not REALLY thought about it if they QUICKLY answer. It’s just an interesting topic to discuss. $5 Million is a lot of money, but the Television industry is MASSIVE! According to http://StatisticBrain.com the average American spends over 5 hours/day watching TV; so let’s not act like the question I’m posing is a ‘no-brainer’. For me, I really don’t watch much television, but this is a tough one once I started thinking about the Olympics, World Cup, World Series, Super Bowl, Presidential Debates, and all the other social-type entertainment. That being said, let’s have a little fun with this! 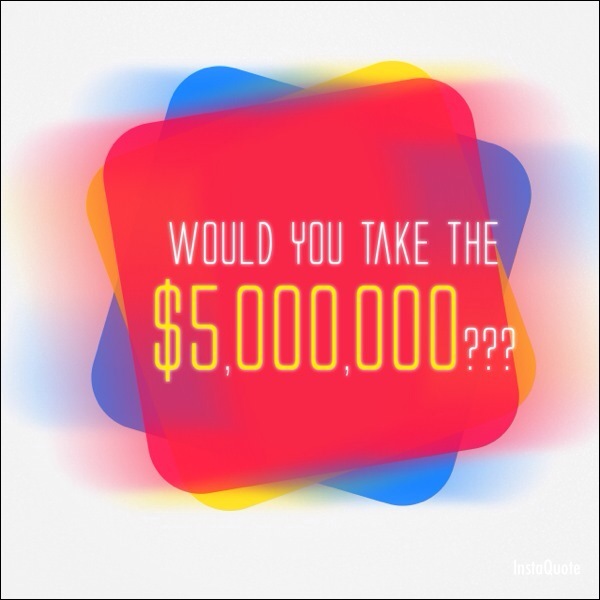 What would you do with $5 Million??? How would you spend it…or save it? Would you go on vacations? Start a Charity? Buy a new car? Make donations to your favorite cause? Buy a new home? Help friends and family members out? Pay off your student loans and become debt free? It’s a fun exercise that I like to do every once in a while that get the creative juices flowing. I would love to hear your responses!